Suit FRESH is the first product to clean, remove odors and conditions your suit all in one. It is made with organic ingredients. It eliminates odors, uric acids, sweat, salts and sunscreen. EZ sprayer to make cleaning wetsuits fast, effective and easy. 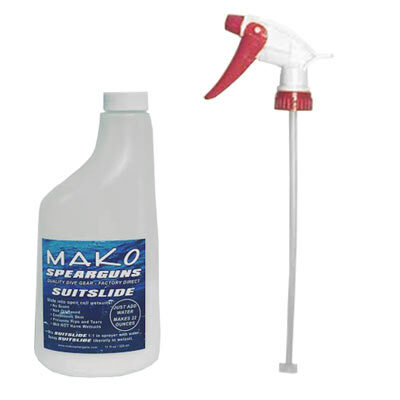 Suit FRESH does not require pre-mixing or a multiple step cleaning process. Suit Fresh is equipped with a sprayer. Point, shoot, agitate lightly and rinse. With the 'weekend warrior' in mind, the Suit Fresh 8oz bottle is equipped with an inverted finger tip sprayer designed for even and convenient application. The small bottle makes it easy to carry to the water. Bottles are recyclable and BPA FREE. Our Suit Slide wetsuit lubricant is scent free, non-allergenic, non-petroleum based, water soluble, and a high performance lube that actually nurtures the neoprene while leaving absolutely no unwanted residue. Using a scent free and petroleum free lubricant will increase the life and effectiveness of your suit. Suit Slide..Slide into your suite with ease! Learn more about Suit Slide here.